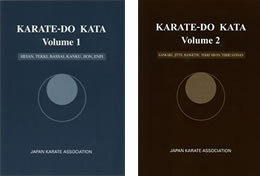 These books, the bible of JKA karate kata, are the authoritative English-language volume whose contents are to be applied in all 116 countries that have JKA involvement. Close study of it is the only way to ensure that your kata are flawless. In it you will find clear diagrammatic explanations of the fundamen-tals of kata that are evaluated at all tournaments, including: Volume 1 Heian Shodan, Heian Nidan, Heian Sandan, Heian Yondan, Heian Godan, Tekki Shodan, Bassai Dai, Kanku Dai, Jion, and Enpi and Volume 2 Gankaku, Jitte, Hangetsu, Tekki Nidan and Tekki Sandan. Other volumes in this series are currently being translated.